Early word suggests the answer is “yes.” Critics are saying that the film features a strong, subtle performance by Bradley Cooper as Chris Kyle, and that the film humanizes the “support our troops” sentiment without totally glorifying it. While Tim Grierson of ScreenDaily says that the film lacks the complexity of the earlier “Flags of Our Fathers” and “Letters from Iwo Jima,” he also says film does great work showing the mindset people have to be in putting their lives on the line for others. Mileage may vary (Inkoo Kang of The Wrap says it salutes a movie trope more than the troops), but this looks like it could be Eastwood’s most broadly appealing film in a while. 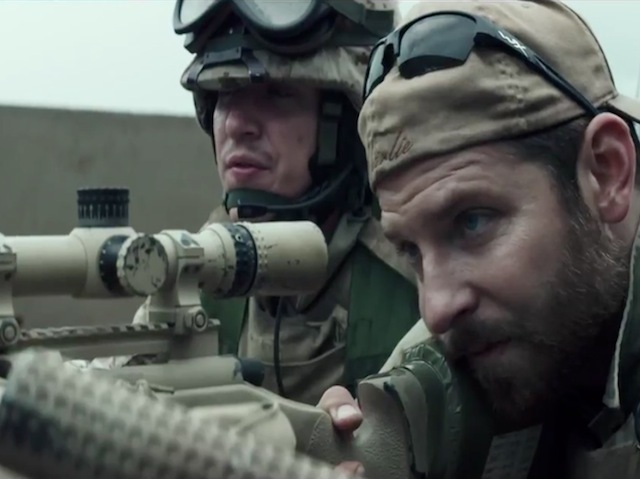 “American Sniper” hits theaters December 25. Hard-wiring the viewer into Kyle’s battle-scarred psyche thanks to an excellent performance from a bulked-up Bradley Cooper, this harrowing and intimate character study offers fairly blunt insights into the physical and psychological toll exacted on the front lines, yet strikes even its familiar notes with a sobering clarity that finds the 84-year-old filmmaker in very fine form. Read more. “American Sniper” doesn’t critique Kyle’s simplistic attitude toward his military service, honoring his conviction without necessarily celebrating it. In Cooper, Eastwood has cast an actor whose intensity and likability are both crucial: Bearded and burly, Cooper plays a guy who may be a bit of a redneck but who is also deeply committed to doing the right thing and helping others. Without condescending to the man he’s portraying, Cooper suggests Kyle’s unpretentious, guy’s-guy demeanor. Read more. What makes “American Sniper” such a deeply unsatisfying film, though, is that Eastwood recuses himself by and large from delivering a judgment. Perhaps the ambiguity regarding Kyle’s unexamined nationalism and chest-thumping manliness merely reflects the dividedness of the country on social mores, but, like the ubiquitous Punisher skulls on Kyle’s troops’ tanks, it’s not clear whether it’s meant to be disappointingly juvenile or fearsomely awesome. Read more. Eastwood handles the tragic ending with a tact underlined with irony, creepiness and a sense of loss that echoes any number of his previous films. He might have gone deeper into the ways the war infected his subject and the struggles he faced after his final homecoming, but whatever the script ignores Cooper goes a long way to filling in…nothing the actor has done before suggests the dramatic assuredness he brings to his way of detailing Kyle’s self-control, confidence, coolness, genuine concern for his comrades-in-arms, compulsion to serve his country and ultimate realization that enough is enough, even of the thing he loves most, which is war. Read more. The film’s singular focus on Kyle comes at the expense of any well-developed secondary characters. His fellow soldiers aren’t characterized much more deeply than his enemies, nor is his perpetually concerned better half. But if Eastwood doesn’t devote much time to the kind of nuanced concerns that made “Letters from Iwo Jima” so worthwhile, it’s mainly because Kyle doesn’t have time for them either. The few soldiers who allow the existential quandaries of their situation to weigh too heavily on their minds and consciences are not only ineffective but dangerous to be around. Kyle survives more than 1,000 days in the thick of it because of his single-mindedness, not in spite of it, which isn’t to say he makes it home entirely unscathed. Read more. American Sniper was def. compelling. But at times it felt weirdly rote, and only Bradley Cooper’s strong perf registers as a full character.